If you're a long-time reader of this blog you may have wondered why I never seem to share anything vintage that I actually buy. The answer is I really haven't bought all that much, to tell you the truth. I'm really picky, and don't spend my money on just any old artifact. 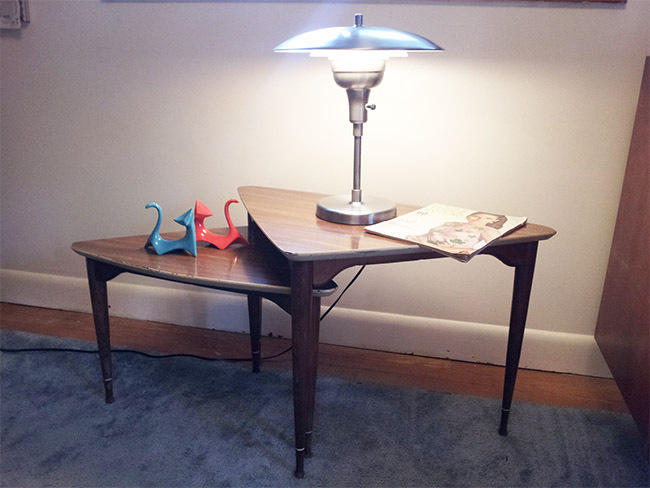 But earlier this summer, on a whim, I went on eBay and for some reason did a search for mid-century modern furniture. And that's when I had an out-of-body experience, after spotting these stacking tables on the first page of search results. Have you ever seen something and knew immediately that you just had to buy it? Have you literally heard an inanimate object calling your name? "Paaaaamela. Paaaaamela....I belong to yooooooooou. Buy me, baby!" Well, that's exactly what happened. I hadn't even planned on purchasing anything -- just wanted to browse the site after having a regular paycheck again -- but when I saw them online nothing was going to stop me from having them. When they arrived and I carefully unwrapped the packaging from around each leg, I knew that had I made the right decision. Had I seen these in person in a shop, I absolutely would have snatched them up. Yes, they're definitely a half century old and show their age as well as signs of usage -- the pale yellow paint around the edges is chipped and there's some water stains and scratches on the larger table (by the way, if anyone reading this knows how to remove either from a Formica surface, please let me know.) However, that just tells me that the previous owner(s) loved them as much as I do. 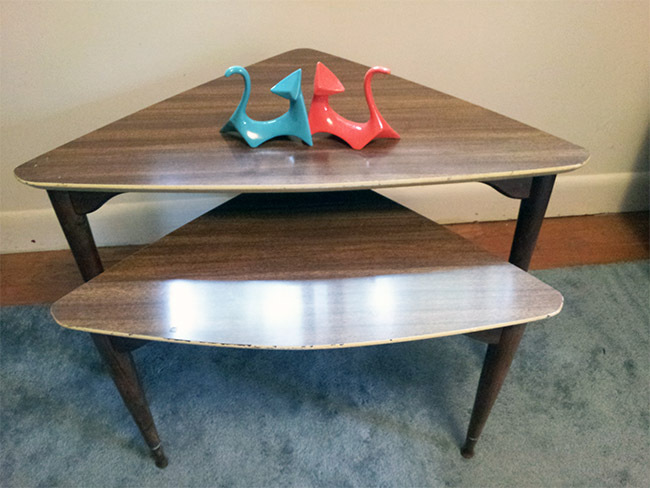 I don't know who the manufacturer was; there's no info anywhere on these vintage beauties, but they're very well made and I'm guessing it was a Danish furniture maker. I got them from an antiques store in Hudson-on-Croton, NY for a few dollars less than what the seller had listed them for (thanks to the "make an offer" option on eBay. I think I got a great deal on them.) I fell in love with their modern triangular shape and that they can be configured in a number of ways. 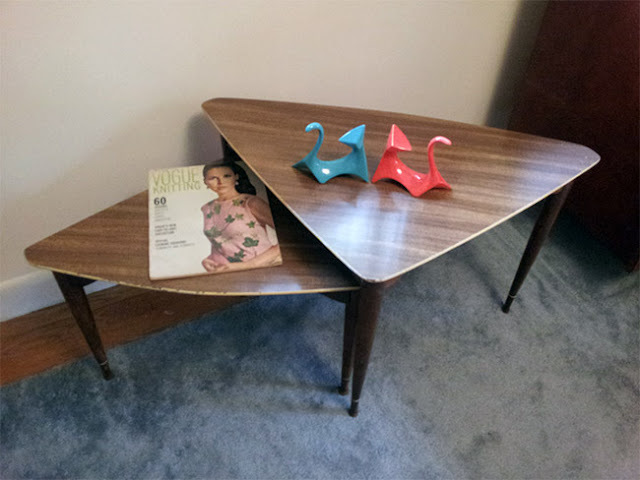 Shortly after receiving them and putting them in my bedroom I realized they needed some sort of mid-century modern sculpture to keep them company. I wasn't too crazy about what was currently on eBay, so I turned to Etsy and that's when I came across an online shop called Making Clay Memories, operated by a ceramics designer named Dana Flemming. If you dig mid-century modern ceramic sculptures, then you'll go crazy over her merchandise just like I did. Dana owns several vintage clay molds from the 1950s and '60s including ones of cats, owls, songbirds, horses, and even quails (so if you want a set that looks like The Partridge Family birds from the opening credits, even in the same colors, she's got you covered!) Did I mention the color selection? Everything she makes can be customized from dozens of available colors, including golden yellow, chartreuse, retro pink, jade, and more. 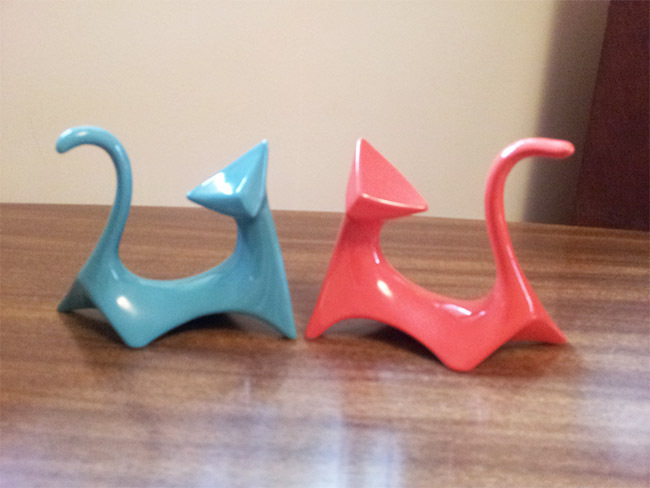 Being a cat lover as well as a fan of the abstract shapes of these particular molds, I went with a pair of her Atomic Modern Minimalist cats in tangerine orange and aqua blue. Keep in mind that if you do order an item from Making Clay Memories that these sculptures take a couple of months to create. They have to be molded, dried, glazed, etc. and Dana also does a strict quality control on every item she produces, and if there's a flaw she's been known to start the process all over again to get it right. A lot of people use her sculptures as wedding cake toppers, so I would suggest if you need a pair for that purpose to get your order in super early and months in advance from the date you plan to tie the knot. I've reached out to Dana about the possibility of her doing a giveaway with Go Retro, so stay tuned! I love my "new" tables and new (for real) cat sculptures. 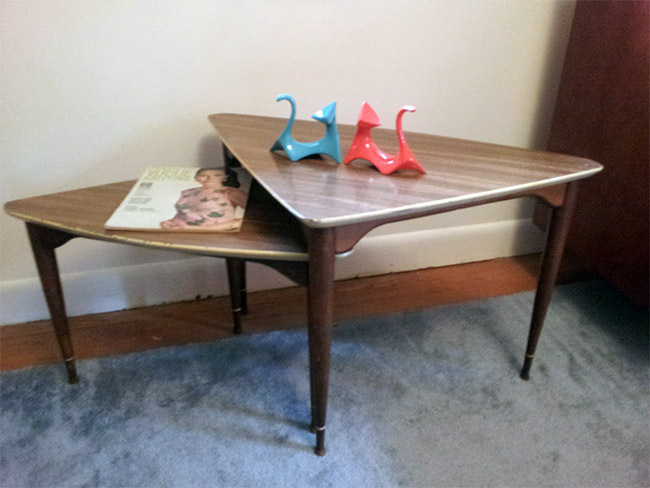 I plan on collecting more mid-century modern pieces and touches for my own home someday. Thanks, Doug. I got that lamp years ago...I think from Crate & Barrel or Pottery Barn. 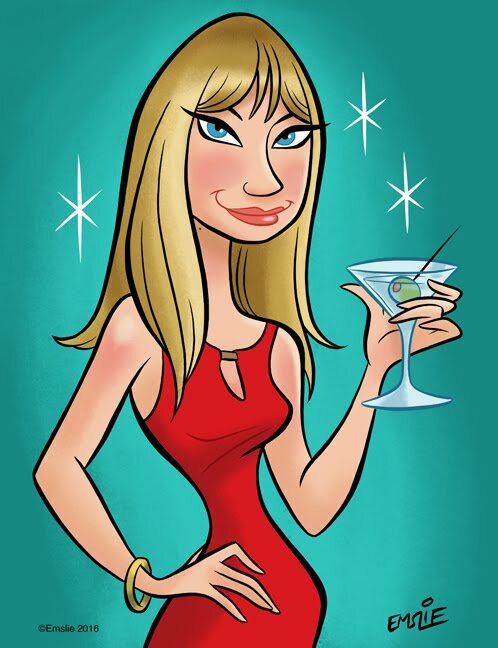 Congrats Pam! Love it! And the cats come in all pretty different colors! Great buy, you've inspired me, my fellow cat lover!